KA-BAR Army Straight Knife with Leather Sheath | BUDK.com - Knives & Swords At The Lowest Prices! 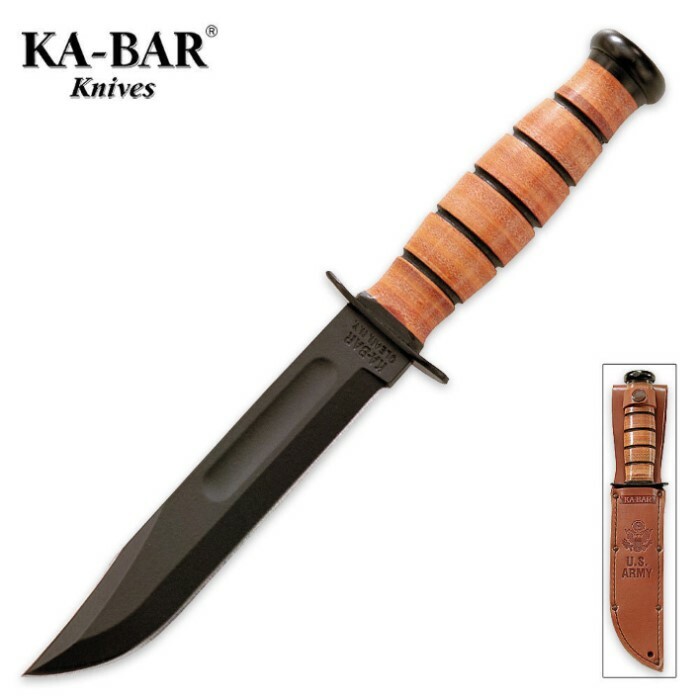 The traditional KA-BAR is marked for Army personnel and equipped with a straight blade. This battle-tested design has remained unchanged for decades and is still proudly made in the U.S.A. If you need an all-purpose knife that will never let you down, this is the knife for you. I spend a lot of time outdoors and always have a knife handy. I have numerous knives but always wanted a Ka-Bar. I am hard on knives and break them often and couldn't bring myself justify the price of an $80.00 knife, since I assumed it would be trashed in a few days, like some of my others. I thought the hype about Ka-Bar was just that-hype.However, I broke down (after breaking yet another, lesser knife), opened up my wallet and shelled out the loot. GLAD I DID! This is the Holy Grail of knives. Solid, balanced, strong and absolutely the sharpest knife I ever had straight out of the box. Fit and finish are perfect. Balance is terrific. I'm a believer in American quality and workmanship and if I had only gotten this years ago I would have saved a lot of money by not having to buy cheaper knives over and over again. I live in a rural area and carry a knife among my gear everywhere I go, and this knife just retired all my other knives. I'll be getting a few more, but the first one has me sold on Ka-Bar quality through and through. The legend about this knife and its capabilities are very true. From now on, only Ka-Bars for this outdoorsman. GREAT KNIFE! USA made KA-BAR, best knife made. Got the Army, Navy, and USMC for my siters boy as his birthday gift. Had KA-BAR for years, best you can get. THIS IS ONE HELLUVA GOOD KNIFE,AM GOING TO HAVE TO GET A FEW MORE FOR GRANDSONS. hAVE ALWAYS LIKED THESE,FROM ARMY DAYS. SHIPPING WAS FAST AS USUAL. This is a very solid knife, and came recommended by some reliable people. Good sheath, no looseness in the handle/tang/pommel/guard settings, sharp, everything you could want in a field knife. Much better than the cheap imitations.